1. What is Wyoming’s “almost” state cookie? (K) one (1) twelve (12) ounce package of chocolate chips. (D) Bake eight (8) to ten (10) minutes at three hundred seventy-five (375) degrees Fahrenheit. 2. Who sent the telegram informing Wyoming of statehood? 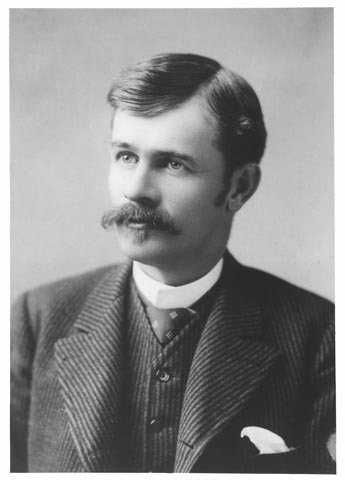 During the summer of 1890, Territorial Governor Francis E. Warren traveled to Washington, DC, to help lobby for support of Wyoming statehood in Congress. Congress seemed favorably disposed toward adding states to the union, having added North Dakota, South Dakota, Washington and Montana in November 1889. The first official step toward statehood had come in February 1888 when the Territorial Assembly passed a jointed resolution asking Congress for legislation that would enable to people of Wyoming to draft a constitution and organize as a state. 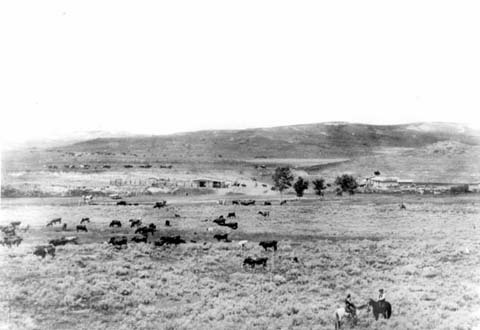 Though several members questioned Wyoming’s readiness in terms of finances and population, Governor Warren, Wyoming’s lone congressional delegate Joseph M. Carey, and several of Wyoming’s political heavyweights campaigned mightily. The bill for statehood was introduced into the House of Representatives by Carey in December 1889. Desipite much vocal support, it was not until July 10, 1890 that an act was finally signed into law by President Benjamin Harrison. 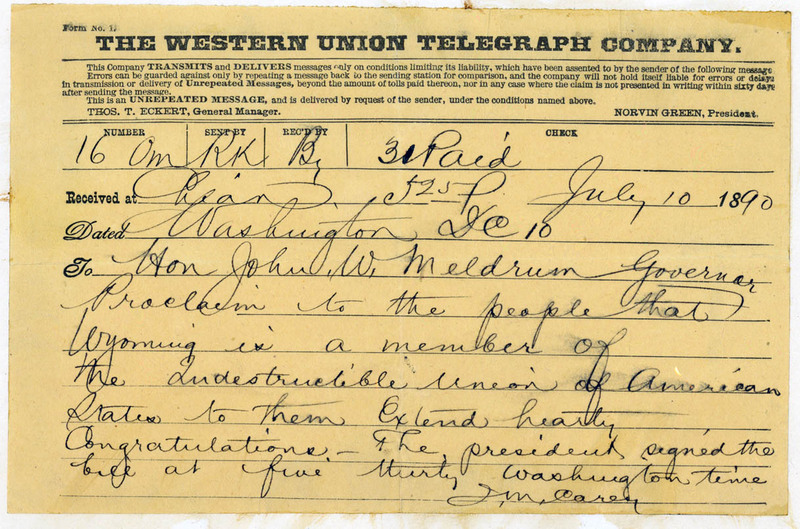 That same day, Carey sent a telegram to Acting Governor (Territorial Secretary) John Meldrum announcing the news. 3. The Cheyenne Daily Sun used what color ink to celebrate Statehood? In 1890, nearly every newspaper was published using black ink but the Cheyenne Daily Sun changed things up a bit to celebrate statehood. They used red and blue ink throughout the 8 page paper on June 29th. This issue reported the passage of the statehood bill in both the Senate and House of Representatives. All that remained was a signature by President Harrison, which was assumed to be imminent. Colored inks were more costly than the standard black and dual tone copy, like the red and blue used that day, were also more labor intensive than using a single color. But it was well worth the extra cost and time to celebrate such a momentous occasion. 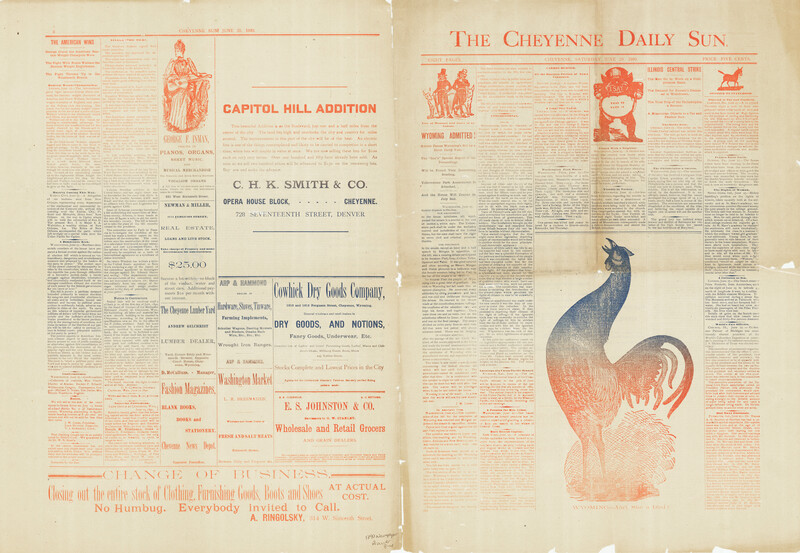 The Cheyenne Daily Sun printed their June 29th, 1890 issue in red and blue ink to celebrate statehood. 4. The official Wyoming 44 star flag was presented by whom? Esther Morris presented the official 44-star American flagon behalf of the women of Wyoming to Governor F.E. Warren at the statehood celebration on July 23, 1890. Money was contributed by women around the then territory and covered the cost of the flag. Co K of the Wyoming Girl Guards was the guard of honor for the flag. 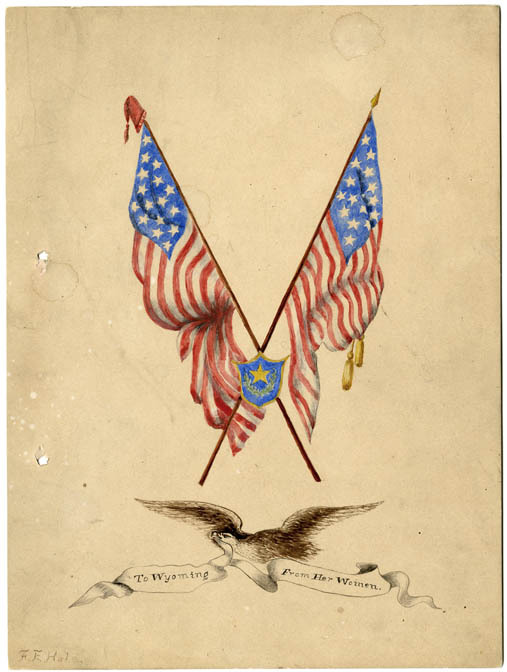 Cover of the booklet listing all of the women who contributed to the purchase of the 44-star flag presented during the statehood celebration in 1890. 5. How long was the original Wyoming State Constitution? 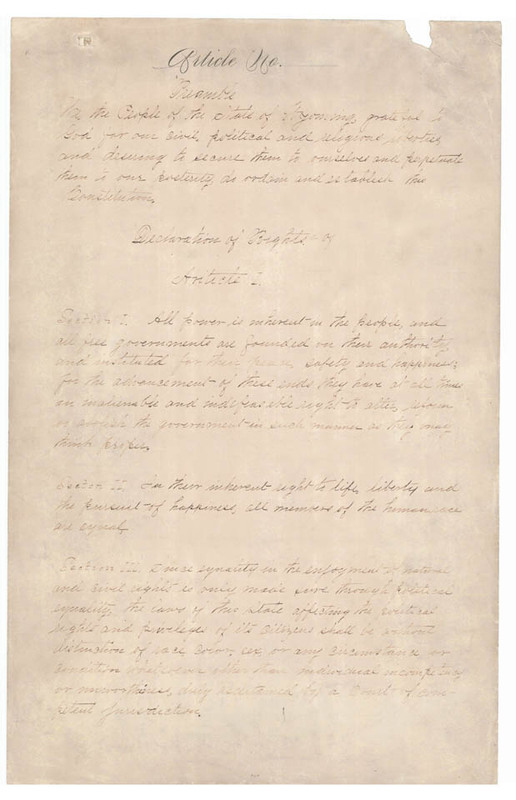 The original Wyoming State constitution includes 40 hand-written pages. Wyoming’s constitution is one of the longest in the nation and includes over 300 sections. It is nearly 5 times longer that the United States Constitution! Preamble of the original, hand-written Wyoming Constitution. Don’t forget to stop by the Historic Governor’s Mansion tomorrow, June 21st, to join in the fun! 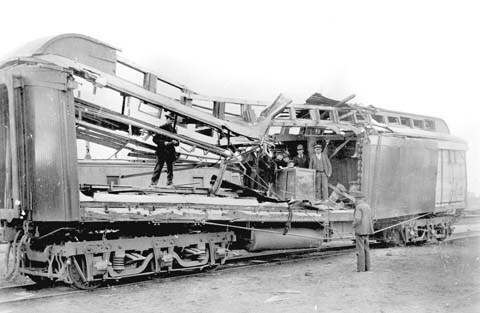 The Union Pacific Railroad Car after it was blown up by dynamite during the robbery. For rest of June, confusing reports swirled around the country as members of the Curry and Wild Bunch were pursued by posses of lawmen, soldiers and concerned citizens. The situation escalated further when Sheriff Joe Hazen of Converse County was killed in a confrontation with the outlaws at Dugout Creek, 10 miles north of Casper. By the middle of June, rewards of up to $3000 per outlaw were offered jointly by the Union Pacific Railroad and US Marshall’s Office. 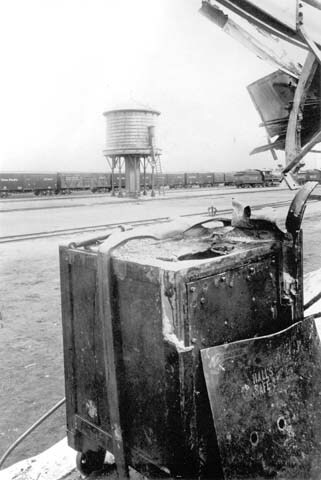 The outlaws used dynamite to blow open the safe. It is unknown just how much money was actually stolen, but it is believed to have been more than $10,000. Unsigned $100 treasury notes were used to track the robbers through the region. 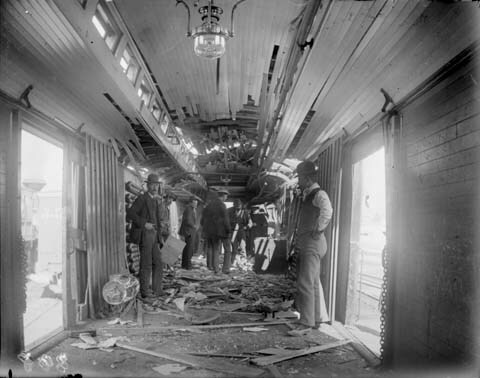 The interior of the railroad car. The posses included many of the most notable lawmen in the area. These men were determined to bring the outlaws to justice by any means necessary, including the use of a pack of bloodhounds brought out from Beatrice, Nebraska. The high profile nature of the crime caught the attention of the Pinkerton Detective Agency who also sent “operatives” to aid the investigation. It is believed that US Marshall Frank Hadsell and Tom Horn, both of whom were involved in the investigation, were Pinkerton operatives. Hadsell would later pursue Horn himself and orchestrate his capture. Various military organizations offered their assistance. 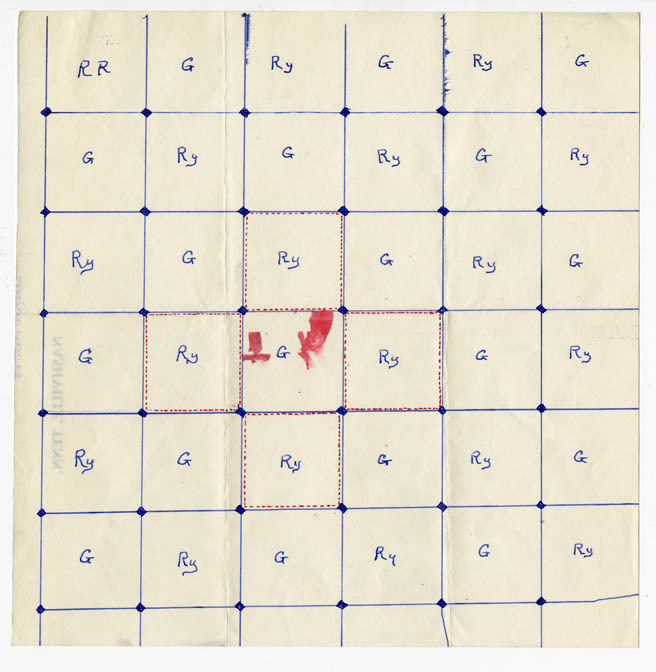 Governor DeForest Richards ordered a group from the state militia to join in the pursuit and he visited Casper himself to be updated on the situation. Regular US Army troops were also called out from Fort Washakie and a contingent from the Wind River reservation also participated. 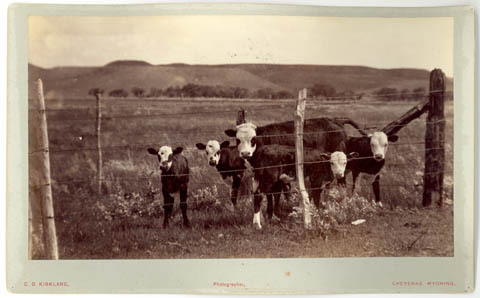 Some of the men who pursued the Wild Bunch after the Wilcox Train Robbery. 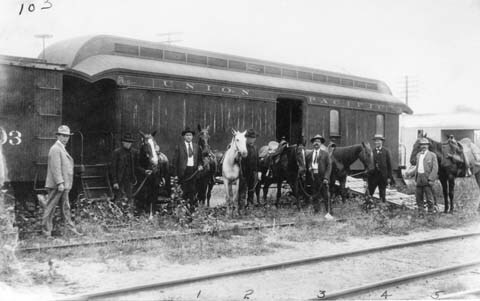 The Union Pacific shipped posse members and their horses in railcars to save time help the men catch up to the bandits. By the end of June, the trail had gone cold. In August 1900, the Union Pacific express train was again robbed at Tipton, Wyoming, netting the bandits nearly $50,000 in gold. The Wild Bunch was also credited with this crime, but they eluded the posse again.